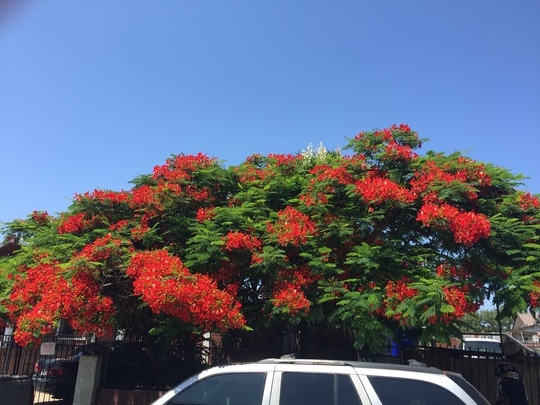 Another gorgeous flowering Royal Poinciana flowering in San Diego, CA. Photo taken Aug. 8, 2018. You certainly have got the heat this year for the flowering. Its nice to see certain trees like this can survive it though even if you can't lol. Delonix regia can stand extreme desert heat with not problems. This tree grows even better out in the low deserts of California and Arizona. It even doesn't need water out there, which amazes me! It's a magic tree then amazing how it survives with no water and in the desert it must work like a cacti. In Madagascar where it native, it's monsoonal climate. In winter it's dry and summer is the rainy season. For some reason this tree can tolerate extreme heat and severe dryness once established. It appears to grow much larger in climate that have more rain during summer, though. It sounds to me that it is good at storing water and releases it according to how hot it is have you thought it works that way. It's seeds have a fatty oil it's roots can up raise pavements so must have a vigorous root system perhaps this is how it survives searching for water and the leaves are used to cure dietetics it also is medicinal for anti inflamotary and other diseases. Yes, a lot of medicinal uses from this tree. It's roots can be quite invasive. Here in South California the roots go deeper because of the extremely long dry season. In wetter areas the roots stay on the surface and cause a lot of problems. It surprised me the tree had a medicinal use. I can imagine the damage the roots cause in wetter areas. Yes with your area being a drought area the roots will go deep. Yes, many trees have so many medicinal uses. Luckily, this tree can be planted pretty close to a house here. It does have some surface roots, though. Yes they do say for every illness there is a cure in plants its knowing tge amount or mix. It's great you can have it close to a house there. See who else is growing Delonix regia - Royal Poinciana. See who else has plants in genus Delonix.